Your message gave me the deepest pleasure. I ish I felt more worthy of the great trust imposed in me. 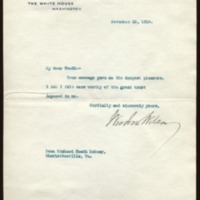 Wilson, Woodrow, 1856-1924, “Woodrow Wilson to Richard Heath Dabney,” 1916 November 23, WWP20513, University of Virginia Woodrow Wilson Letters, Woodrow Wilson Presidential Library & Museum, Staunton, Virginia.